Glasgow Tower to the left, Scotland's tallest tower, at the Glasgow Science Centre and IMAX cinema building. Satellite view is showing Glasgow, the largest city in Scotland and fourth most populous city in the United Kingdom. The city is located on the River Clyde in central west of the Scottish Lowlands, Glasgow is one of the largest seaports in the world. 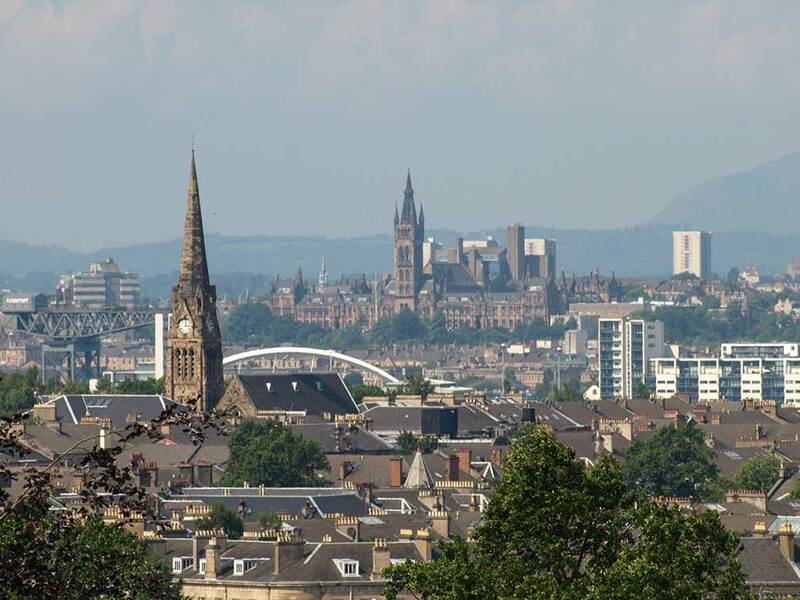 View of Glasgow's South Side from Queens Park with the tower of the University of Glasgow in the center. Glasgow is one of Europe's top twenty financial centers and is one of the UK’s most visited cities. It is also the seat of the Archbishop of Glasgow and of the University of Glasgow, one of Scotland's four ancient universities (founded in 1451). Glasgow has a population of about 600,000 inhabitants, 1.9 million people live in its urban area (in 2016). Spoken languages are English and Scots. In the UK's EU referendum on 23rd June 2016, Glasgow voted 66.59% to remain. Scotland has voted to remain in the EU Referendum by a majority of 62% to 38%. Glasgow Tower, Scotland's tallest tower, at the Glasgow Science Centre with a nearby IMAX cinema. Riverside Museum, all about transport, cars, bicycles, ships, trams and locomotives. Burrell Collection, thousands of years of history collected by a Glaswegian shipping magnate. Clyde Auditorium, known as "The Armadillo", a concert venue and auditorium deigned ny Norman Foster. Just zoom in to see Glasgow Tower and the Glasgow Science Centre at the River Clyde. In 2013 Glasgow came to the attention of the world when on the 29th November in late evening a police helicopter crashed into 'The Clutha' pub in Stockwell Street, corner Clyde Street, on the banks of the River Clyde in Glasgow. The Map shows a city map of Glasgow with expressways, main roads and streets, Glasgow International Airport (IATA Code: GLA) lies west of Glasgow city center. Zoom out to find the location of Glasgow Prestwick International Airport (IATA Code: PIK) about 46 km (29 mi) southwest of the Glasgow near Prestwick. Google Map: Searchable map and satellite view of Glasgow, Scotland, United Kingdom.